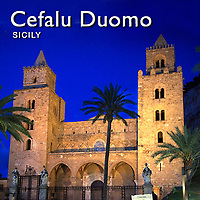 Pictures of Cefalù Cathedral. Images & photos of the medieval gothic Cathedral & mosaics. Also buy stock photos & photo art prints. The Cathedral-Basilica of Cefalù, (Italian: Duomo di Cefalù) is a Roman Catholic church in Cefalù, Sicily, southern Italy. The cathedral, dating from 1131, was commenced in the Norman style, the island of Sicily having been conquered by the Normans in 1091. According to tradition, the building was erected after a vow made to the Holy Saviour by the King of Sicily, Roger II, after he escaped from a storm to land on the city's beach. The fortress-like character of the building, which, seen from a distance, rises as a huge bulk above its medieval town, may in part reflect the vulnerability of the site to attack from the sea. It also made a powerful statement of the Norman presence.